Lacquer Lockdown: Lesson Lockdown: What Is A Marshmallow (Squishy/Sticky) Stamper? Lesson Lockdown: What Is A Marshmallow (Squishy/Sticky) Stamper? A. Squishiness - caused by two properties of the silicone pad. Elasticity or the ability of the pad to return to its original shape. These two properties come together to create the squishy nature of the pad which we desire and which can vary from head to head. They can be extremely firm i.e. little to no squish like the Konad stamper which is rubber (and therefore NOT a marshmallow stamper) or they can be extremely squishy like the old Winstonia Store replacement pads. An ideal marshmallow stamper would be toward the squishier end of the spectrum. B. Stickiness - caused by some heretofore unknown property or additive to the silicone mixture. After some recent examination of my marshmallow heads I'm starting to think it's some oil based component. This sticky quality is what allows the marshmallow pad a higher rate of successful image transfer to the pad and nail when stamping. However there are degrees of variability within this category. An ideal marshmallow stamper would be fairly sticky or tacky, again like the old Winstonia store replacement pads or the Magno Nails XL stamper. However the most important point I want to emphasize is that there are GRADES or DEGREES of marshmallow stampers i.e. there is more than one type! What are the negatives to a marshmallow stamper? I always like to start with the negatives so that I can get to a happy ending (oy get your mind out of the gutter!). a. Deformation or loss of elasticity. Remember we want the pads to always return to their original shape, but when a marshmallow head is exposed to too much heat or undue pressure from rough handling during shipping you will get tears and misshapen heads. The same is true with repeated exposure to acetone over time. For the same reason apparently when a lot of heat is applied the heads leak oil. This has only been reported to me I myself have never experienced this phenomenon. b. Excessive malleability. We all want this property in a marshmallow stamper just like we want the elasticity however when you encounter a stamper head that has extreme malleability it can be difficult to keep the pad inside the stamper itself though there are ways to get around this. For instance you can try placing hot glue or glitter nail polish inside of the stamper tube itself, use a smaller diameter device to hold the pad, etc. If there is an interest I can discuss these fixes in more detail on a separate post. c. Images aren't as crisp as a firm stamper. This one is actually false and as evidence to refute this claim I'm going to show you images below on various stampers using Mundo de Unas polish most stampers will agree is the superior/gold standard stamping polish and a Konad plate (always perfectly etched without issues). Image is in order of increasing degree of "marshmallowness" except the new Winstonia head and the Konad head. d. Scarcity. The manufacturers of the silicone heads have for the most part discontinued making the marshmallow stampers mainly because of issue A outlined above. They are hard to store and deform easily resulting in a loss of profit. So, despite what I feel is a healthy demand for the product, these days you will find these heads are very difficult to come by. At least that has been the case until as recently as a month ago. As it turns out Julia McGowan of Messy Mansion, my sista friend and boo, has been able to successfully manufacture these bad boys and as a bonus they are colored. I already have the Pro Set and will be posting a review for that solon. Below I discuss what your options are in terms of tracking one down. What are the benefits to a marshmallow stamper pad? a. Ability to stretch images that are too small to fit your nails. We all have those image plates that don't fit our nails well, but contain images that we really love. This is particularly true if you are a long nail gal like myself. This is where the marshmallow makes itself most valuable as the pad allows you to grip one side of your nail and stretch the image out until it fully covers you entire nail. b. Ability to shrink images that are too large to fit on your nails. Same thing as with the stretch but in reverse if you squeeze the marshmallow pad down with your fingers and then pick up an image that's too large to fit normally you should get a smaller image than what was initially on the plate. This however has a higher likelihood of distorting the images' original proportions. It takes practice and skill to make this as perfect as possible. c. Ability to conform to the curve of your nails. Duh because the pad is soft it naturally curves to your curves. Kinda like the best Victoria Secret Body Bra ever. The marshmallow properties allow a perfect fit. d. Ability to pick up images without rolling on the plate. This is a huge one for newbies because rolling in and of itself is a skill. If you press down directly on an image with the Konad stamper or other stampers that are equally firm you have a light likelihood of missing some of the image or smearing the image. Why? Because these pads have little to no give. You have to roll the stamper over the plate as you would your nail. Quickly, efficiently, and with even pressure to result in the maximal perfect pickup. Then you still have to transfer it to your nail. You see how this could be potentially troublesome for the new stamper. Now that I've gone through all of that let me take the time to show you these qualities up close and personal. Yup that's right like my mama always says seeing is believing Tamira. Now you can see exactly what I mean. 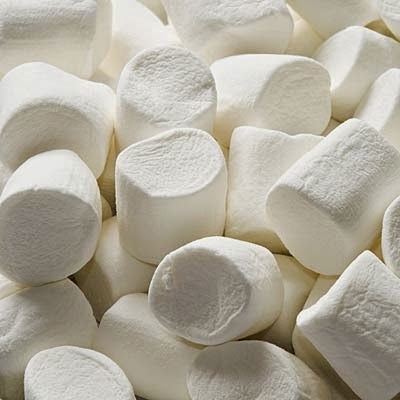 Where Can I Find A Marshmallow Stamper? For now you can no longer purchase this pad from Winstonia Store. I was told directly by their customer service that due to the deformity complaints they remolded them to the new type of pad you saw above - firm and slightly squishy without any sticky component. FabUrNails has similarly told me that the marshmallow heads and the gold caps she sold have also been discontinued by her manufacturers despite her protests and personal demonstrations. If you have to have a stamper that has that marshmallow feel I'd say for now the only real current option is the Magno Nails stamper which is also available at Dashica Beauty Shop OR the Messy Mansion sets on either the .com or .au site when they are restocked. I also understand MyOnline Shop was selling a few though they are out of stock currently. And one more bit of good news appears to be that FabUrNails is also working on creating her own marshmallow stamper . You can also take a chance and search around AliExpress for these stampers though recently it appears the marshmallow stamper on this venue has become almost as nonexistent as the New Zealand Kiwi. Updated marshmallow stampers suppliers (12/2015): In addition to those above these sellers below also have them. I hope that this post has been helpful to both stampers and the manufacturers of the stamping pads. It's not that any one stamper is better or more perfect than the next. It's about the pros and cons of each different kind of stamper and of course the reliability of image transfer from plate to pad to nail. And we know this varies from user to user and with experience. I can see that the old Winstonia silicone marshmallow stamper pad had the best image transfer of each of those stampers. If I had to surmise the reason why it's because it has the highest percentage of whatever makes the pad sticky. I could actually hear it squelch as the pad came away from contact with the plate, but pickup from the plate to the pad does not always equate with transfer from the stamper to the nail and that's where preference and experience will guide your choice. That is an extremely useful information and a great piece of work. Thank you for this post, Tamira. Aww thanks Mary! I will put up a video for how to prime stampers for sure it's actually an upcoming blog post. It will be separate from the Messy Mansion Pro Set review though since that one is going to be fairly detailed as well. Very informative, Tamira. Great job putting this together! I didn't know MM is going to stock Magno. I wasn't quick enough to order their coloured stamper heads, so I'm so looking forward to your review! Great post. You can find Fab Ur Nails marsmallow heads with silver cap on the DashicaBeautyShop site. I do not know how many she has left in stock. Actually, that's not the case. I spoke with Johanne of FabUrNals about those stampers and they aren't the same as the old ones. Those are the new squishy firm variety ij the silver caps. The last stock of marshmallow stampers from FabUrNails were offer from Ilarrowe and are now sold out. Great post!! Please share the on other alternative holders for the squishy stamper! I just found your post on Google and it was super helpful. I just got the Moyou rectangular stamper and it was driving me nuts sticking to everything and squishing so much it pops out of the holder with the slightest pressure. Definitely need to try the hot glue or glitter polish thing with it! Thanks for the info!